A delightfully dreadful cold snap that's colder and snappier than any we've seen in the past couple of years will spread over parts of the northern United States later next week as a lobe of the polar vortex—yes, that polar vortex—breaks off and spins south for a couple of days. Worry not, my friends, for the polar vortex smells your fear. This will not be the worst outbreak of Arctic air the northern United States has ever seen. It will be cold. It will be colder for longer than we've seen in a while. It will be dangerously cold in some spots, so much so that going outside with any exposed skin could lead to frostbite or worse in just a couple of minutes. There's no sugarcoating or facetious weather blogging that can mask how brutal and potentially dangerous the cold will be. 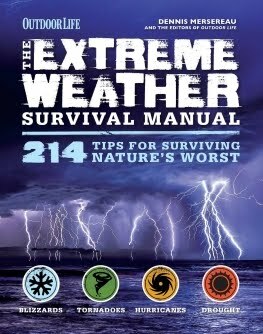 No authentic weather panic is complete without a scary buzzword to help drive headlines deep into your psyche. 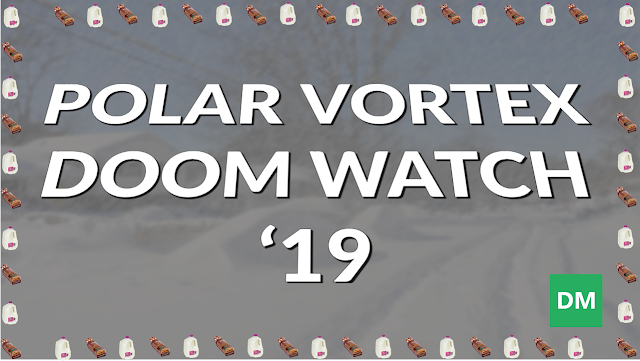 Since 2014, the buzzword of choice for any Grade A Cold Snap is "polar vortex." Despite the lack of earth-shattering records, though, we've neatly transitioned into collectively losing our marbles over the term "polar vortex" with the stellar efficiency of a Japanese rail company. The polar vortex is real. It's been around forever. It's a large-scale, upper-level circulation that typically encircles the Arctic regions during the winter months. The most popular analogy is to describe it as an atmospheric moat that helps keep winter's coldest air confined to the farthest reaches of the Arctic Circle. The polar vortex is fairly stable most of the time, but major upheavals in the jet stream can cause the circulation to become wobbly, sending tendrils of the circulation diving south toward the lower latitudes. Sometimes a piece of the vortex can break off, resulting in a frigid cutoff upper-level low meandering southward for several days before it's reabsorbed into the broader circulation. That's it. That's all it is. It's not some day-after-tomorrow kind of aberration or a Langolier that's tired of chewing on the past and wants you for dessert. Sort of like "derecho" and "atmospheric river," though, the foreboding nature of the term makes it perfect for click-seeking news coverage to run with and snag the interest of people who have never heard it before. The scenario we'll see this week is a piece of the (rather disheveled) circulation breaking off. An impressive upper-level low will traverse southern Canada and slowly move across the Great Lakes during the middle of next week. The above animation shows the GFS model's vision of the 500 mb level of the atmosphere through the middle of next week. You can see the upper-level low in question over the Arctic Ocean at the beginning of the animation and track it south through Nunavut, reaching the Great Lakes midweek before it begins to retreat toward northern Quebec where it belongs. This change in patterns will allow some of the coldest air in the northern hemisphere to wash over the Upper Midwest, Great Lakes, and parts of the Northeast for several days, resulting in high temperatures that don't even come close to climbing above zero. This animation runs from today (Friday, January 25) through next Thursday, January 31. 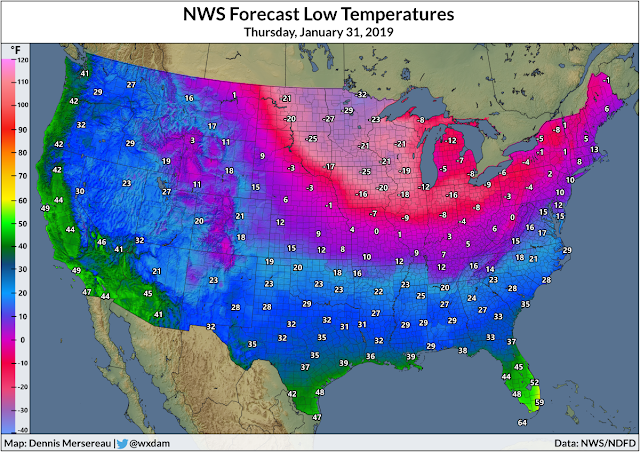 I created those maps of the NWS forecast at about 10:00 PM on Thursday night (my life is thrilling), so some of the forecast data may be different by the time this post is published, but the underlying message is still there: Brr. The Upper Midwest will bear the brunt of the cold weather. The very coldest temperatures seem to follow the Mississippi River through Minnesota, Wisconsin, and Iowa, where low temperatures in the -20s and -30s will be widespread toward the middle of next week. The temperature in Minneapolis is expected to drop below zero on Monday afternoon and stay there through the end of the week, if not longer. The same is true for towns all across the region. The Weather Prediction Center keeps a nifty website that keeps track of all the NWS's predicted temperatures and compares them to daily records for those locations. More than 30 locations across the region are predicted to see record-low maximum temperatures (or the lowest high temperature) for January 30 and January 31, and a few dozen locations will come close to seeing record lows over the same period. Looking at the cold air on the map is almost pleasing for someone not in the worst of it—the temperature contours on Wednesday almost perfectly radiate away from the Great Lakes like a ripple on a pond—but it also means that few parts of the country will remain untouched by the below-normal temperatures. Subfreezing nighttime temperatures will reach all the way down to the Gulf of Mexico for a couple of days, sparing only the southwest, extreme southern Texas, and southern Florida, all three of which stand out like sore thumbs on a map of abject misery. A fast-moving storm system will precede the outbreak of very cold air. Right now, it looks like the storm will drop several inches of snow on the Upper Midwest and Great Lakes on Monday, with some totals reaching 6" or more in spots. The fresh snowpack will add insult to injury with such cold air moving into place. Apropos of everything, all of the forecast data I used in this post is sourced from National Weather Service meteorologists who are working full schedules without a paycheck during the longest government shutdown in history. 800,000 federal employees missed another paycheck today and may have to begin February by telling their landlords, credit holders, utilities, schools, and everyone else that they don't have the money to pay them because their paycheck was $0.00 again. People are going to go hungry. People will lose their homes. Some people will lose their lives because they can't afford medicines and medical treatment. The good folks at the National Weather Service are powering through the payless-shutdown without missing a beat, predicting one nasty storm after another, spending time away from their family to serve in a government that, at the present, doesn't believe they deserve a paycheck. We're far beyond neutrality and "stick to the weather" territory. If you care about the weather—if you care about your neighbors and fellow Americans who are hurting—please contact your state's senators and demand that they vote to reopen the government. We're all so much better for the dedicated service of our federal workforce. They give us so much. The least we could do is fight on their behalf.